Come and sail through the serene and tranquil backwaters in Kerala, India. Check out Kerala back waters. Perhaps the most wonderful place to relax in God's own country are the backwaters of Kerala. The long stretches of uninterrupted peace and serenity while you sail in the traditional houseboats of Kerala is an experience not to be missed at any cost. The crystal clear water, lined with dense vegetation and the sweet chirruping of birds while you look at the sunset from a distance is something that will leave you leave you mesmerized and keep you asking for more. So read on further to know about the famous back waters in Kerala, India. The Alleppey backwaters are an ideal way to explore the slow moving life of Kerala. Once you set out to explore the Alappuzha backwaters, you will yourself feel that time stops at this place. If you really want to know what are the ingredients that make a paradise, visit Cochin backwaters. The backwaters of Kochi are an ideal way to unwind in the stunningly beautiful and calm waters. The extensive backwaters of Thiruvananthapuram, Kerala present a beautiful kaleidoscope of the dynamic scenery. One of the best ways to enjoy your trip is to go on Trivandrum backwater tours. One of the most beautiful backwaters destinations in Kerala, Kottayam is famous for its natural wealth of stunningly beautiful backwaters. 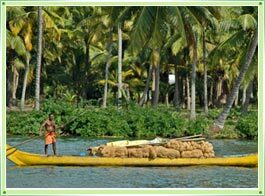 Kottayam backwater tours are the best way to explore the serene and calm environs. Kollam is situated near the famous Ashtamudi Lake and is one of the most scenic landscapes that Kerala has to present. The lush green vegetation and placid and crystal clear water makes the backwaters of Kollam the gateway to the beautiful backwaters of Kerala. Located at a distance of 15 kilometers from Kottayam, lies a small cluster of islands on the famous Vembanad Lake. These cluster of islands on the vast lake make up the Kumarakom backwaters.